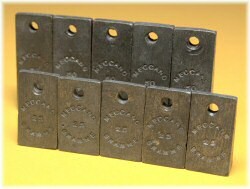 Lead weights are one of the many sought-after 'obsolete parts' in the Meccano system. Introduced in 1916, they were supplied only in the Outfit 7 starting in 1922, lasting until 1929. They were dropped from outfits in 1930, along with a number of other interesting parts as the outfits were substantially overhauled. Almost entirely useless, these are not used in any of the outfit 7 models! Only Supermodel 16, the original Meccano Loom, calls for four of the 25g weights part number 67 (although it shows only two of part 66 instead in the illustration). This model was not at all satisfactory and was soon replaced by Supermodel 16a, the 'improved' Loom, which doesn't require the weights at all. Several people have attempted to make reproductions of these rare and expensive parts with varying degrees of success. Bill Inglis made them in the 70's, and describes his method in this page here . They can also be found cast in white metal (which are obviously not the correct weight, but are ok to look at). Wear and patina is generally the best guide to identifying genuine ones, but you should be very wary of buying these parts on their own unless you are pretty sure of the seller's knowledge and reputation. The only reason to have or buy these parts nowadays is to complete an outfit 7 of between 1922 and 1929. A "full set" of lead weights is the number in this outfit – five of each, as shown in the picture to the left. As well as plain cast lead (by far the most common variety), these weights can also be found nickel-plated, and painted gold. According to DMS/EMP, gold painted weights were the standard from 1934 onwards (although of course they were only available as spare parts in this colour). I'm not aware of when the nickel-plated versions were produced, but they seem to be earlier than the 'plain lead' versions if the stamping is anything to go by. The most common variation of these parts are the ones made in the French factory during the 1920's. These are some of the only parts I know of that have their Meccano part numbers printed on them – you can see the words "Piece No.66" and "Piece No.67" on the parts shown to the right. 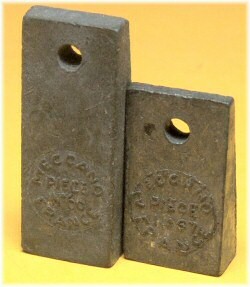 Note that in these examples the wording is stamped into the mould, and is therefore proud of the surface of the weight. In the English-made examples, the parts appear to have been moulded first and then stamped Meccano, and thus the stamping is recessed into the part. The picture to the left shows a blue painted version of the same thing, also French. Roelf tells us that this looks like a genuine part (and indeed it is in the correct pre-war French blue). I will be extremely impressed if anyone manages to find a boxed set of these. On the other hand, since the parts were almost never called for in a model, perhaps there are a lot of these around that were never sold? 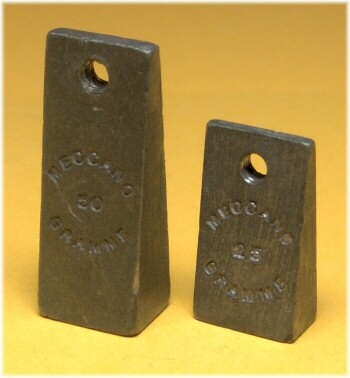 Does anyone have any genuine Meccano lead weights with the spelling "GRAMMS" instead of "GRAMME"? I suspect that the GRAMMS spelling indicates a good replica. The 50g weights are used in the Single Suspension Grab of Model 7.11 (SML 35), so the statement “these are not used in any of the outfit 7 models” is incorrect. The parts list of SML 35 omits part No. 66, however! Exw meinei eksssaiatmenos apo tin simerini (idiaitera) emfanisi. Stekomai (ksana) sta logia tou Giannaki meta ton agwna:"Νιώθω περήφανος γιατί με το μπάσκετ που παίζει αυτή η ομάδα καταξιώνεται αυτό που διδάσκουμε τόσο σε αγωνιστικό, όσο και σε ανθρώπινο επίπεδο." I've been thinking about having ago at making some of these i.e. making a mould melting some lead ect. but i am not sure of all the dimentions, could any one help please will be most gratful. Many regards iosilverroy. I have a couple of these (both 25 and 50 grammes) with the Fabriqué en Angleterre text embossed. If you want pictures just let me know. Before I managed to acquire some of these weights, I found that Elektrikit Rectangular Cores would suffice quite well.